The Chiefs earned their first win of the Super Rugby season with an emphatic away bonus-point triumph over the Bulls, while the Sharks beat the Rebels on Saturday. Brodie Retallick, Alex Nankivell and Solomon Alaimalo all scored twice as the Chiefs romped to a 56-20 win at Loftus Versfeld. New Zealand lock Retallick struck either side of half-time to end the match as a contest, Alaimalo and Nankivell having earlier gone over as the visitors seized control. Nankivell scored again before Te Toiroa Tahuriorangi and Alaimalo put the icing on the cake with tries inside the last six minutes. The impressive Damian McKenzie, who was named man of the match, added 21 points with the boot. Jesse Kriel claimed a consolation try while the Chiefs were shorthanded with Alaimalo in the sin bin. Burger Odendaal also went over late on - those efforts plus 10 points from Handre Pollard, the competition's top scorer this season, accounted for the Bulls' scoring. The Chiefs, who remain bottom of the New Zealand Conference, had failed to win any of their first five games this season, while the Bulls missed the chance to go top of the South African pool. In Durban, the Sharks scored 12 unanswered second-half points to defeat the Rebels 28-14. The home side led by 10 midway through the first half, boosted by Daniel du Preez's early try, but they briefly trailed after Tom English and Jack Maddocks dotted down for the Rebels, with Quade Cooper integral in both scores. Robert du Preez's penalty had the Sharks up by two at the break, before he went on to score a try himself after the interval on his way to 18 individual points. 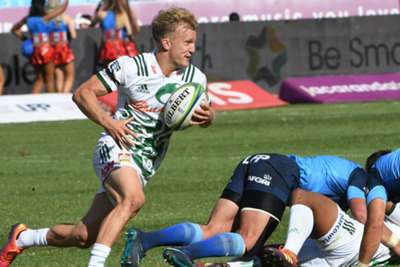 Makazole Mapimpi's score just before the hour mark ended any hopes of a comeback from the Rebels - who remain second in the Australian Conference – as the Sharks snapped a two-match losing streak.